Let us train, coach and mentor you for not just a job….but for a successful career! Learn the art of persuasive selling techniques from a true professional. Over 40 Dealerships now supporting this program with over 230 candidates now trained and hired . 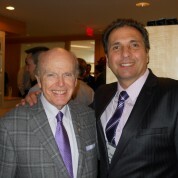 Paul Iacobazzi at an award winning luncheon with Billionaire and auto industry tycoon Mr. Jimmy Pattison.